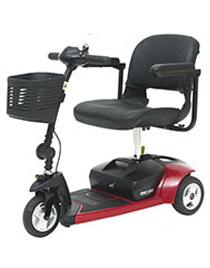 Travel scooters are lightweight, versatile and good for indoor and outdoor activity on level surfaces. Because of their smaller size, they maneuver well in tight spaces and either fold or disassemble for easy stowing in most car trunks or other vehicle compartments. Need a seat between 17 and 18 inches wide. Why are incline ratings and ground clearance important? Video: Travel scooters are easy to take apart and bring along with you.